However, I am pleased to find that my kids, in grades one and two, are learning about residential schools. Most of the learning happened on Orange Shirt Day, but hopefully this will become a regular part of the curriculum. It can’t just end at school, though. I could tell from the questions they asked me that they didn’t quite understand what happened, and why. So I got them some books. I also happened to read a short story collection touching on residential schools at the same time. Here are three ways to learn more about residential schools in Canada, for whatever level you are at. That this document wasn’t for me, because I wasn’t one of those racist people who needed to be convinced that Indian Residential Schools were horrific or that they have a lasting legacy. That the above belief is extremely naive and I would likely have to challenge some beliefs and/or confront some ugly truths, and maybe I’m not ready. As usual, reality was somewhere in between. The TRC is for me, as much as it is for you (Canadian readers, or really, anyone who lives in a country that’s ever been colonized.) There were plenty of things I already knew, but many I didn’t. Even if you’re familiar with the history, the first-hand stories are important to read, as are the calls to action, all 94 of them. It helped that I found a reading group, which included an inter-generational survivor who was familiar with the report and its history. Most of you won’t have that much support, and this is a long, dense document, so here are some resources, tips, and recommendations for further reading. If you’re not Indigenous, and think this isn’t for you, read this essay at 49th Shelf. Read it in chunks. Our reading group took months to read, just a section or two per week. The sections range from pretty dry descriptions of legal proceedings to heartbreaking first-hand accounts of abuse. Take a break when you need to. Read it to the end. The calls to action are at the end, or you can read them separately here. You may feel hopeless that there’s so much to do, or inspired that there are so many places to begin, but this part is really important. Talk to people. A buddy read, a reading group, an online chat… lots of possibilities. I was lucky to have a ready-made discussion group. If you can’t find someone to talk to in real life, try #TRC on twitter. For non-fiction recommendations, check out the end of that essay I linked above, or, check out this list at the Edmonton Public Library. This essay at The Toast about missing and murdered Indigineous women and girls was a more challenging read than the TRC, in terms of having to interrogate my personal beliefs and biases. Brace yourself. Up Ghost River, by Edmund Metatawabin. Article includes an extensive Aboriginal reading list. The Reason You Walk by Wab Kinew, about his father’s experience with residential school. I’m going to see Kinew speak in just a couple of days. I can’t wait. Indian Horse by Richard Wagamese. I read this with a library book club where most of the participants are in their 60s or older. Many of them remembered residential schools as something that was known, but not known. They knew the schools existed, but not why, and certainly not what went on inside. An intense discussion ensued. 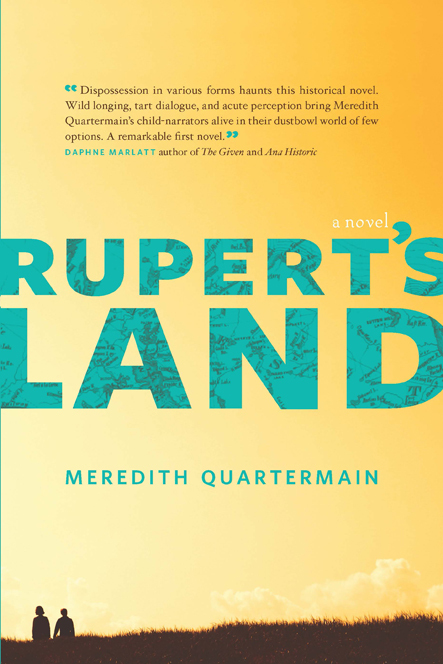 Rupert’s Land by Meredith Quartermain (my review) about a residential school runaway and his unlikely friend. Kiss of the Fur Queen by Tomson Highway, which I haven’t read, but has been recommended to me more than once. King Leary by Paul Quarrington. This one’s more hockey than residential schools, but there is a compelling minor plot about a survivor. The Orenda by Joseph Boyden and Black Robe by Brian Moore. These books are about first contact, but that history is important, too. Many of us read Black Robe in school, and I hope The Orenda will replace it in the curriculum one day. Black Robe really emphasizes the colonial perspective and frames Aboriginal people as “other” while The Orenda is a more balanced perspective. 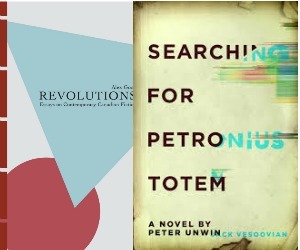 Many thanks to tireless TRC reading group organizer Jane, and to advocate, TRC expert, book nerd, and all-around super star Miranda, for help with and inspiring this post. At the height of the Great Depression, two Prairie children struggle with poverty and uncertainty. Surrounded by religion, law, and her authoritarian father, Cora Wagoner daydreams about what it would be like to abandon society altogether and join one of the Indian tribes she’s read so much about. Saddened by struggles with Indian Agent restrictions, Hunter George wonders why his father doesn’t want him to go to the residential school. As he too faces drastic change, he keeps himself sane with his grandmother’s stories of Wîsahkecâhk. As Cora and Hunter sojourn through a landscape of nuisance grounds and societal refuse, they come to realize that they exist in a land that is simultaneously moving beyond history and drowning in its excess. I try to go with my gut when I rate books, but sometimes, I make a change after letting a book digest for a while. I gave Rupert’s Land three stars at first, but as you can see, I’ve upgraded my rating to four stars. In the week since I finished it, I often find myself thinking about the story, the characters, and the historical context. I keep thinking that I need to recommend this book to people. Doesn’t sound like three stars to me. The writing is poetic, relies of streams of consciousness from our main characters, and has some quirks, like made up compound words and a lack of punctuation. The latter actually didn’t bug me, but I know it does some people. You will find a smattering of Cree vocabulary as well – don’t worry, there’s a handy glossary in the back. I would compare the style to Faulkner or even the little throw-away chapters in The Grapes of Wrath, you know, like the one where the men are at the car dealership and the reader “hears” the background noise and snippets of conversation. You going to wear schoolgirl bloomers all your life? Netty leans against the door frame dropping one hip. A deep dimple creases soft white flesh overhanging the knickers. Golden fuzz coats her sturdy legs. Rather do that than end up married to Bunk. Rate you’re going, you’ll end up an old maid. A fussy frump then. In her blue lisle stockings. Her face like a lastyear apple, a witch’s nose touching her witch’s chin. End up a schoolmarm with a stick body and claws for hands — children running away from her, boys making stink bombs and shooting spit balls at her A is for apple over and over on the blackboard until she died. But she’s not going to make herself all fluffy and cushy like Netty does.